[S6] G.E. Cokayne; with Vicary Gibbs, H.A. Doubleday, Geoffrey H. White, Duncan Warrand and Lord Howard de Walden, editors, The Complete Peerage of England, Scotland, Ireland, Great Britain and the United Kingdom, Extant, Extinct or Dormant, new ed., 13 volumes in 14 (1910-1959; reprint in 6 volumes, Gloucester, U.K.: Alan Sutton Publishing, 2000), volume VIII, page 417. Hereinafter cited as The Complete Peerage. [S6] Cokayne, and others, The Complete Peerage, volume V, page 105. [S6] Cokayne, and others, The Complete Peerage, volume VIII, page 418. He was educated at Cambridge University, Cambridge, Cambridgeshire, EnglandG.3 He held the office of Page of Honour to HM King Edward VIII.3 He succeeded as the Lord Mautravers on 5 February 1532/33.3 He held the office of Deputy Governor of Calais between 2 July 1540 and February 1544.3 He succeeded as the 19th Earl of Arundel [E., c. 1138] on 23 January 1543/44.3 He succeeded as the 19th Earl of Surrey on 23 January 1543/44. He succeeded as the 12th Earl of Arundel [E., 1289] on 23 January 1543/44.1 He was appointed Knight, Order of the Garter (K.G.) on 18 May 1544.3 He fought in the war against the French in July 1544, where he was 'Marshal of the Field', and distinguished himself at the taking of Boulogne.3 He was appointed Privy Counsellor (P.C.) 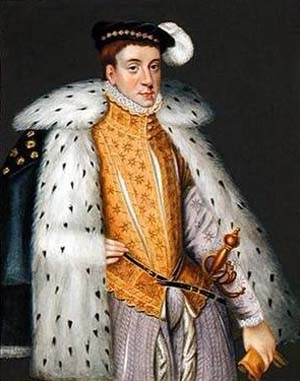 in July 1546.3 He held the office of Lord Chamberlain between July 1546 and January 1550.3 He was one of the Council of Twelve, named by King Henry VIII in 1547.3 He held the office of High Constable, at the coronation of King Edward VI.3 Between 8 November 1551 and 3 December 1552 he was imprisoned in the Tower, by the hostility of the Duke of the Northumberland.3 He took revenge on the Duke of Northumberland by pretending to join him in setting up Lady Jane Grey as Queen, then betraying him to Queen Mary, and arresting him at Cambridge.3 He held the office of Lord Steward of the Household in September 1553.3 He held the office of High Constable, at the coronation of Queen Mary.3 He held the office of Lord High Steward [England] on 17 February 1553/54, at the trial of the Duke of Suffolk.3 He held the office of High Steward of Oxford University between 1555 and 1559.3 He held the office of Chancellor of Oxford University between 6 February 1559 and 12 June 1559.3 In 1564 he resigned all of his offices.3 He was a Commissioner at the trial of Mary, Queen of Scots in 1568.3 Before 1572 he was again imprisoned, for aiding his son-in-law, the Duke of Norfolk, in trying to obtain Mary, Queen of Scots in marriage.3 His last will was dated 30 December 1579. He was "of the middle size, well proportioned in limb, 'stronge in bone, furnished with cleane and firme flesh, voide of fogines and fatnes.' His countenance was regular and expressive, his voice powerful and pleasing; but the rapidity of his utterance often made his meaning 'somewhat harde to the unskilfull.6' "
[S6] Cokayne, and others, The Complete Peerage, volume I, page 251. [S6] Cokayne, and others, The Complete Peerage, volume I, page 252. [S6] Cokayne, and others, The Complete Peerage, volume I, page 253. From 6 February 1609/10, her married name became Erskine.1 After her marriage, Lady Jean Hay was styled as Countess of Mar on 14 December 1634.